Getting best grill cover you can is the key to keeping your backyard grill in tip-top shape. The sun and rain will beat on your grill, abusing the finish and fading the paint. No matter the how good the quality of the finish on your grill is, eventually the elements will win. Your first line of defense is to get a heavy duty grill cover, and use it whenever possible! The simple fact is that a waterproof, UV-protected cover will absorb the brunt of the elements, leaving your grill looking great for when you’re hosting that backyard BBQ. After a thorough examination of several of the top grill covers available, we have determined that the Classic Accessories Ravenna line of grill covers [Amazon Link] is the best choice for grill protection. With five different size configurations available, a thick woven polyester material, and a lifetime warranty, it’s hard to beat the Classic Accessories Ravenna line of grill covers. For a complete review of this grill cover, as well as several other excellent covers available on the market today, please see the Product Reviews section below. One of the Best Grill Covers! The first challenge is finding the right BBQ grill. Gas or electric? LP Gas? How many burners, how portable, what style, and what finish do you want? There are many options to consider. But eventually that decision is made, the grill is delivered, and much cooking ensues. Cookouts are hosted, families and children are fed, everybody is happy about the grilled goodies, and the chef capable of making such delicious food. And then the rains and snows come and ruin everything, including the grill. But, wait! It’s a good thing you have your grill covered with one of the best grill covers available. Getting the right heavy-duty grill cover is crucial to protecting your investment, and a proper cover is a necessity in virtually all outdoor environments. From excess sun bleaching the finish color, to unwanted critters moving in, to snow and rain pitting the metal, there are a variety of ways a grill can get damaged. Proper care and maintenance are key, and that starts with getting the right cover for your grill, and using it whenever possible (but be sure to wait until the grill is cool!). This post examines many of the options available for the best grill cover, whether the grill is gas or charcoal. Your backyard grill may not be huge, but it is the heart of your outdoor kitchen, and many use their grill constantly over the warm months. There are several aspects to consider when contemplating the right grill cover for your needs. Among these considerations are material quality, weather-resistance, size, aesthetics, and form-fitness. When searching for a BBQ grill cover, the most important aspect to consider is the quality of the protective material. Will the cover actually do the job of protecting the grill underneath? The thickness of the material and the way in which it is secured in place are important properties of a grill cover. Is the grill cover merely water-resistant, or is it waterproof? The ability to leave your grill out in all weather, from rain to snow, to hot sun, is important, and the weather-resistance of each cover must be considered. Will the cover properly fit onto your grill? You’ll need to know the dimensions of your grill, and compare the cover to your existing grill size. A misfitting grill cover may blow away, leaving the grill exposed to snow and ice. When not in use, a grill is commonly covered. You may be staring out your kitchen window at a grill cover every day, so aesthetics do play a role. Color selection and logo placement are key. Does the cover have an elastic security band or some other type of cinch that can allow the cover to pull tightly around the grill underneath? Without some sort of elastic or pull, a grill cover may be poorly-fitting and allow creatures to set up shop inside or may allow water where it shouldn’t go. Here we will do four grill cover reviews, and consider the features of each. We will consider the pros and cons of the various covers, look at the size options and details, and determine our favorite. 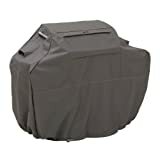 The Classic Accessories Ravenna Grill Cover line of high-quality BBQ grill covers is an outstanding choice for protecting your outdoor cooking investment. With a lifetime warranty, you can be confident that these covers are designed to handle it all! Made with Gardelle One durable polyester fabric, and finished with an attractive greige color scheme, the Ravenna line is the best out there, whether for patio furniture covers, patio heater covers, fire pit covers, or anything else! With five size options for grill covers available, you should be able to find a Ravenna cover that will fit most any grill on the market. This chart shows the five different sizes of Ravenna Grill Cover available, and what grills will fit in each cover. Like many manufacturers, Classic Accessories doesn’t go with the simple Small/Medium/Large sizing, and instead starts with Medium, and goes up to XXXL. Use the chart to figure out which one best fits your grill. Here is a quick video that showcases a few of the major features of the Classic Accessories Ravenna Grill Cover line. The Classic Accessories Ravenna grill cover has two webbed handles that make taking the cover off the grill a snap. It also features a well-made cinch system with four belt buckles that will enable the cover to hold fast to your grill, no matter what the weather. Near the handles are two mesh air vents, which allow air to flow through the cover, keeping it dry, while also helping prevent it from flying away in a gust of wind. The fabric consists of an exterior panel in an attractive grayish beige tone and an inner waterproof layer that keeps water away from the grill. Elastic cords help hold the grill cover in place, and double-stitched seams mean extra reinforcement where the cover needs it most. The Ravenna line of covers is made of Gardelle Fabric, which is UV treated and should not fade or deteriorate in the sun. The cover is protected under a lifetime warranty, which is outstanding. That said, if you start to see the cover failing, be sure to contact Classic Accessories for a replacement before it fails completely and ruins your grill! The Classic Accessories Ravenna Grill Cover is the best grill cover available. With five sizes to choose from, an outstanding design, attractive aesthetics, and a lifetime warranty, these are hard to beat. With proper use, and with the warranty offered, they will last not just the lifetime of your grill, but your lifetime as well! They are not the cheapest grill covers around, but they will last forever, and the great feature of the lifetime warranty makes them an easy recommendation. They are our top choice among grill covers. First up is the NFL Delux grill cover set, a well-made grill cover option, emblazoned with the logo of whichever NFL team you love most! The logo is printed only on one side of the grill cover, so depending on the location and position of your grill when it’s not in use, the logo may be a nice feature for your back patio or deck. This cover is made of a hardy vinyl base, lined with a soft white felt interior liner. This two-layer design works to protect the finish on your grill while keeping water out. This is a good design and is similar in theory to the Ravenna cover line above. Of course, these are not covered under a lifetime warranty! This cover measures 68″ long x 21″ wide x 35″ high and is capable of covering the vast majority of four burner grills out there. If your grill is significantly smaller than this, the cover can be tightened to fit snugly. If it is a six burner grill, you should check your grill’s measurements carefully against this cover’s dimensions to ensure proper fit. It has a very useful hook-and-loop Velcro closure mechanism, with stitching rated to handle 30lb of pressure. It is easy to clean with soap and water and resists stains and mildew nicely. This cover is a high-quality cover that does a good job of withstanding rain, snow, wind (if properly fastened) and birds/insects. The soft inner lining treats your grill nicely, and the durability of the material makes it a good choice. There is also a cheaper non-Delux grill cover available that does not have the inner lining. It is much weaker and is a lower quality product overall. We do not recommend the cheaper cover. If you want a cover with the NFL logo on it, it is almost certainly wiser to save up your pennies and get the Delux one, as it is simply a better product. 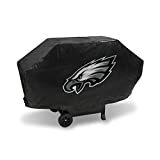 The NFL Delux Grill Cover is an excellent choice for grill protection, and as an added bonus is available through Amazon Prime! A different cover is available with the helmet logo of each of the NFL teams on display, and the background color is nicely combined with the logo for the full effect. If you love football, these super cool grill covers. If not, you may want to check out some of the other grill covers that offer less design, but more protection. The Char-Broil Heavy Duty Grill Cover line is a solid line of grill covers and is an excellent choice among the best grill covers available today. With four different sizes to choose from, this cover works well. It is attractive yet simple and capable of warding off the elements. As long as you don’t mind the Char-Broil logo, especially if you don’t have a Char-Broil grill! The Char-Broil Heavy Duty Grill Cover comes in four sizes: 32″, 52″, 53″ wide, and 72″ wide (shown above). The 53″ fits most small and medium covers, while the 68″ and 72″ are generally capable of covering most larger grills on the market, including some 6 burner grills and smokers. The Char-Broil cover uses the same two-layer design that has become fairly common over the past few years, with a 300D Vinyl outer layer, and a PVC inner layer for water protection. There are no handles on this cover, which is a bit of a downer, but there are Velcro straps to secure the cover to the grill. There is also no high-quality cinch at the bottom. The Char-Broil Heavy Duty Grill Cover is a decent choice for a grill cover if you can deal with the potential fading of the material, and the lack of a great warranty. It is hearty and does a good job of withstanding the elements, and is positioned at a decent price point. Still, with no warranty, it’s probably not the best choice, unless you really like the look, or have a Char-Broil grill and want a matching cover. As a bonus, it is available through Amazon Prime (note: the four cover size options have different price points). The URBNGear XL Cabana-Style Two Tone Waterproof BBQ Grill Cover is a great choice, with reasonable aesthetics and heavy-duty protection from the elements. It is available in three size options, is waterproof, and features a two-tone design that is fairly attractive. The handsome Cabana Style Grill Cover is made of coated waterproof PVC (without any interior material) and is rain, snow, dust, and dirt repellent. It has click-close cinch straps on the bottom that ensure a secure fit, though be sure to measure your grill and purchase the correct size. The URBNGear Cabana Style also has a few nice features such as padded handles for easy 0n and off, elastic toggles, and a zipper pocket. It has air vents, meaning no condensation inside the cover, and no risk of rust to your grill. This cover will look great on your deck with its two-tone style, and with three size options, there should be a good fit for whatever grill you cook on. It should be able to handle cold temperatures without cracking. This grill cover can also face hot sun without fading and features a one year warranty. Some owners report that the grill cover tearing over time, but hopefully the warranty will allay any concerns of ripping. In the medium-sized grill cover option, the URBN Gear is also available with a couple of options: a grill mat, and a grill brush. The URBN Gear Cabana Style Grill Cover is a great choice for a waterproof grill cover. It is covered under a 1-year warranty, but that is obviously not ideal! Given that it is fulfilled by Amazon, offers a warranty, and is available through Amazon Prime, it reasonable choice for those who like the look. But compared to some of the other options available, like the Ravenna covers, it’s hard to choose these. (note: each of the different sized covers has a different price point).